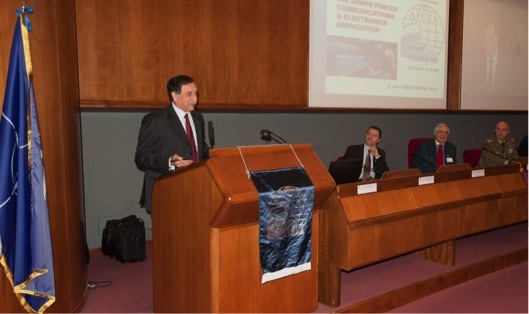 Rome, 14/1 – The Honourable Domenico Rossi, Italian Under-Secretary of State for Defence, attended, as Guest Speaker, at the “Global solutions for Defense, Intelligence and Security” conference, organized by the Rome Chapter of AFCEA. The Hon Rossi focused his speech on the issues of security both in the field of defence & security and in analogous issues, on technological advances, and finally on the need for two folds cooperation and synergies both between countries – especially in Europe – and among the different stakeholders (Defence, Research, Industry, Associations). “We live in a world characterized by increasing geopolitical instability, which raise sensitive issues of defence and security, domestic and international.” “Italy,” said the Hon Rossi mentioning efforts to improve the “culture” of security “is about to give birth to the Defence White Paper”, which, however and contrary to the past, “should be continually updated in function of the evolution of the scenarios “; and a greater dialogue between all participants in the sector is needed so that the message can be translated into a language simple and understandable at all levels. The theme of the Defence and Security was also one of the “points of the agenda of the European Semester Italian Presidency”. The theme has been expanded to include the protection of critical infrastructure, border control, maritime domain, disaster resilience, cyber security, urban security “that is, everything that has been the subject of today’s conference,” because “these are interconnected issues” in a double dimension: multinational and multidisciplinary. “No one can solve alone security problems”, and in the current economic situation, it is absolutely necessary to wider cooperation, and not only among National Governments Organizations, but also involving Industry, Universities, Study Centres and Research.